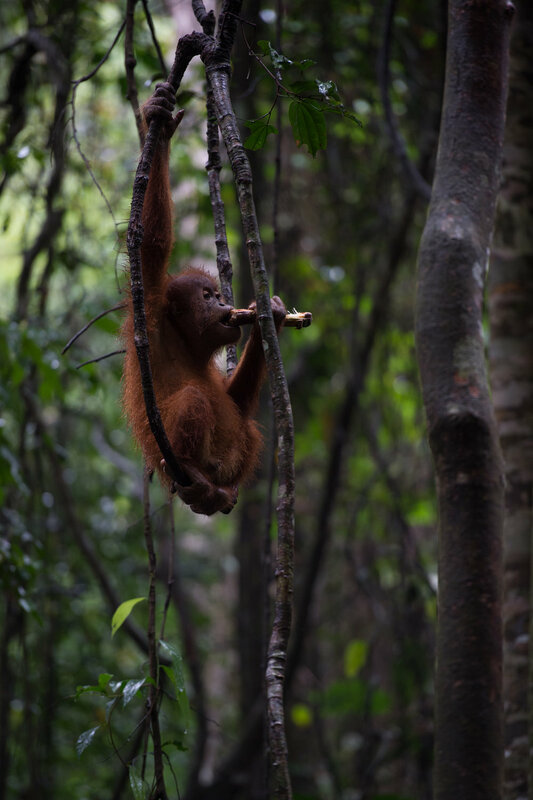 There are only two spots left in the world where you can see wild orangutans. One is Borneo, an island split between Malaysia, Indonesia, and Brunei. The other is Northern Sumatra, a region of Indonesia. While I can’t speak to Borneo, I went orangutan trekking in Sumatra and was absolutely blown away by the experience. Not only did I see multiple orangutans up close, I got to experience trekking in the jungle, encountering tiger footprints, finding a leech on my leg, and rafting down a gorgeous, yet terrifying river. It was an experience which felt real, and didn’t cost much or take a lot of planning. 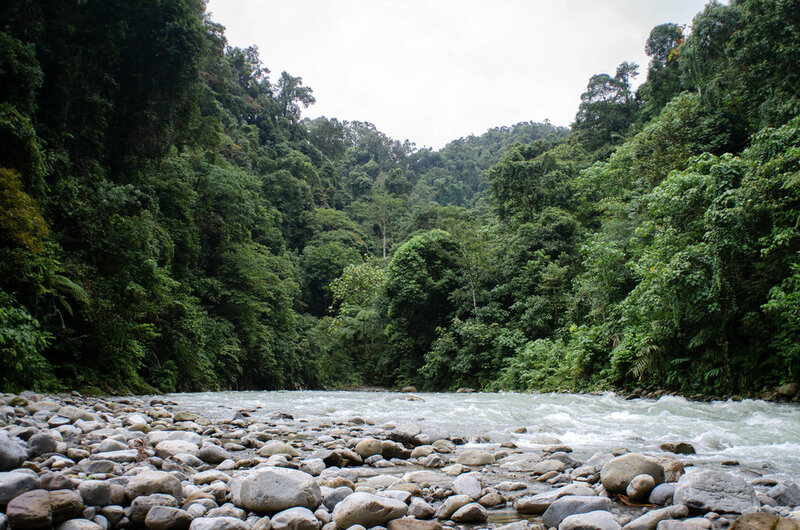 Bukit Lawang is a storybook village built along the banks of a river. The houses are small, jungle surrounds you, and there are little foot bridges everywhere. When I first took it all in, my mouth hung open for a solid few minutes. Accommodation wise, there are a ton of options to choose from here. This village basically survives off of the tourism from trekking, and does their best to provide for all of your needs. While I was in Bukit Lawang, I spent my first night at Lawang Inn. For $15, my friend Rahel and I shared a bungalow style room with our own bathroom and the occasional monkeys peering into the window. After our trekking tour, we switched accommodation and stayed at Fun Family Guesthouse. This was our trekking guide’s guesthouse and was a lot cheaper than Lawang Inn. The easiest and most common way people book trekking tours is through their accommodation. This is because as soon as you arrive at your guesthouse, you’ll likely be asked to sit and enjoy a ‘welcome drink.’ The welcome drink is a cover for your guesthouse to get you seated and talking to them. Then they pull out a sheet with their tour information on it and start playing salesman. If you’ve done your research and have read positive reviews about the tours from your guesthouse, there’s no harm in booking with them. However, if that makes you a little nervous, I recommend booking a tour with Putra from Fun Family Guesthouse. He’s who I booked my tour through, and I had an awesome experience! At 8:30 in the morning, our group of two guides and six guests set off into Gunung Leuser National Park. We walked on foot, and each carried a small backpack with the belongings we chose to carry. Within 10-15 minutes of setting out, we stumbled upon our first orangutan! It was high up in one of the trees a short walk off the trail, and would’ve been easily missed had one of our guides not been scouting for us. We stood around nearby for awhile and watched the orangutan quietly. It stared back at us and then slowly swung through the trees out of sight. Initially, he was up in the trees when we first ran into him, but he didn’t hesitate to get up close and personal. To our delight and slight terror, The King stood within feet of us, staring back at us the way a curious person would. We snapped our pictures, put some space between us, and tried to remind ourselves this was really happening. The only downside of running into The King so early into the trek though, was a lot of other tour groups were hot on our heels. What was first a peaceful viewing of this beauty quickly turned into a hoard of overeager tourists trying to get the perfect shot. As more and more people gathered, our guide got nervous and started ushering us away. As we shuffled past The King, a man from another tour stupidly stuck his phone directly in the orangutan’s face. The King greeted him with a sharp slap - reminding him orangutans like their personal space just as much as we do. We continued onward and eventually ran into Meena, an infamous orangutan in the park. Meena is known for her quick change of mood and tendency to chase tour groups. 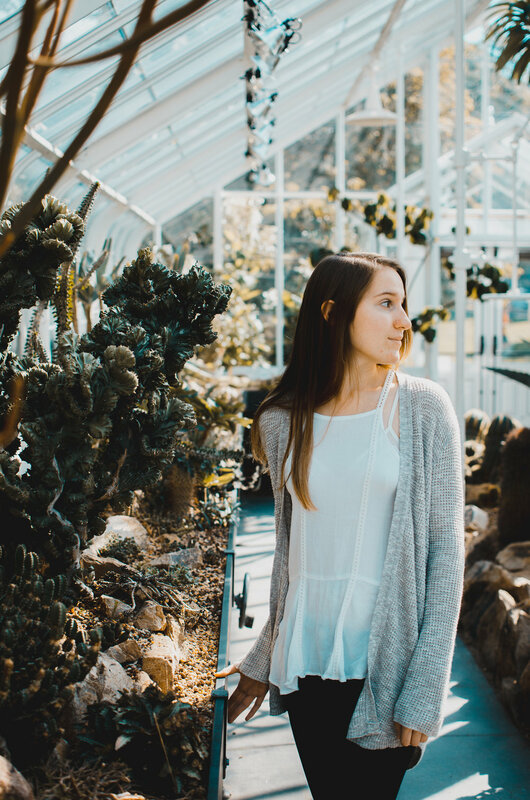 While this may seem a little scary, the guides know her behavior well and will do their best to ensure you have a safe encounter with her (if you see her that is). Sure enough, our visit with Meena started out nice and peaceful. Meena and her baby kept to themselves and we stood at a distance. Without warning though, Meena suddenly started toward us. Our guide told us, “we need to move, now!” He didn’t have to tell us twice. We scrambled out of there and continued walking at a steady pace until our guide told us we were in the clear. * Meena may be a little aggressive, but she has every reason to be. She had a tough start in life and was once held in captivity. Her captors did not always treat her fairly, and therefore she has some ill feelings towards humans. The last leg of our trekking on day one took us straight up the middle of a fast-moving stream. It was tough going for most of us as we were all either barefoot or wearing flimsy flip flops. When we finally arrived at our camp about an hour later, we were worn out and ready to relax. Lucky for us, someone was already cooking up some fried snacks and tea for us. We threw on our swimsuits, tested out the water (it was freezing so that didn’t last long), and then curled up in our towels and ate our pre-dinner. Our actual dinner was insanely good! For being out in the middle of the jungle, I was seriously impressed with the spread laid before us. There was fried chicken, fish, pumpkin curry, stir-fried tofu and tempeh, fried potato cakes, and a handful of other yummy dishes. To finish off the night, we had ginger tea and attempted to solve riddles our guide Putra told us. It was the perfect end to our day. We woke up to a straight up downpour. The definition of rainy season had suddenly become a reality, and none of us were eager to start trekking again. When the first break in the rain finally did come, we threw on our backpacks and set off. But it was no joke. We saw the tiger tracks with our own eyes, and boy were they big. By lunchtime, we weren’t sure if we were going to see any more orangutans. It had been a quiet morning with the exception of the tiger tracks, and so far no sign of any monkeys. Then our scouting guide suddenly hollered, “come here, quick!” We dropped our food, and made our way through the trees. Looking up where our guide was staring, we saw a family of siamangs, a type of gibbon. According to Putra, siamangs are incredibly rare to see in the wild. Had the siamangs simply stayed put high up in the trees, our day would’ve already been made and we would’ve continued trekking happily. This was not the case though, and suddenly a large orangutan began swinging through the treetops towards the siamangs. Moving to get out of the orangutan’s way, the family of siamangs began swinging towards us - eventually getting within feet of our group. Personally, I began to get a little nervous. These are wild animals, and I didn’t want to stand in their way or make them feel threatened the way The King had felt the day before. Out of nowhere, Jackie latched onto the arm of my friend Rahel. According to our guide, Jackie had learned to do this as way of getting guides to feed her. She would grab guests by the arm in a vice grip, and refuse to let go until she was given a snack. The unfortunate thing about this is it in turn makes Jackie less wild, and makes her rely on human food. Our guide told us often times other guides won’t hesitate to give into Jackie’s demands for fear of guests getting hurt. Jackie is smart though, and only held Rahel’s arm tightly enough so that she couldn’t get away. Our guide knew this and talked to Jackie as if she were a person, explaining to her he didn’t have food and he wasn’t going to feed her. Eventually, Jackie let go without getting food in return (hooray for our guide)! With Jackie behind us, we began embarking down the final downhill of our trek. It wasn’t so much of a hill though, as a grueling adventure course filled with steep slopes and vines we needed to hang onto. For someone who was worried the trek wouldn’t be challenging enough, I was definitely proved wrong. At the bottom of the hill, the jungle opened up to a river. This would be the launching off point for our raft, and the final stretch of our journey before getting back to Bukit Lawang. Trusting the fact a bunch of people had likely done rafted this river before us and survived, we clamored onto a makeshift raft and hoped our cameras would survive the trip (our guide had wrapped them in plastic bags and assured us they’d be fine...gulp). Then came one of the most exhilarating and beautiful 45 minutes of my life. Sweeping down the river with a guide on either end of our caterpillar-shaped raft, we hung onto our tubes for dear life - constantly switching between screaming, laughing, and gaping at the jungle around us. If only we could raft all day, I thought. We arrived in Bukit Lawang soaked and happy, yet desperately in need of showers. Looking at us you would’ve thought we’d been on a 5-day trek, not a measly 2-day one. A bucket-list worthy experience for sure, and something I’d do again in a heartbeat. 2-days seemed plenty long enough to me. Had it not rained I may have lasted another day, but I honestly saw enough orangutans and other monkeys that I felt satisfied. Putra was a great guide and someone I’d recommend others book with. He respected the orangutans and was very knowledgeable about them and the jungle. Watch out for leeches! They’re everywhere during the rainy season. Check out this article on how to avoid leeches and what to do if you find one on you. Listen to your guide. If he tells you not to get any closer to an orangutan, don’t get any closer. Not only are you endangering yourself if you don’t listen to your guide, you could potentially endanger the rest of the people in your group. Grab my free packing list below. The jungle is no walk in the park (especially during rainy season). Subscribe to my email list and I’ll send you information on how to access my free jungle trek packing list. Not sure what to pack for the jungle? Sign up for my email list and I’ll give you access to my free travel resources library (you’ll find a jungle trek packing list there)! Thank you! Once you’ve confirmed your subscription you’ll get a welcome email with information on how to access my free travel resources library. This post was created in collaboration with Timodur Stahl. 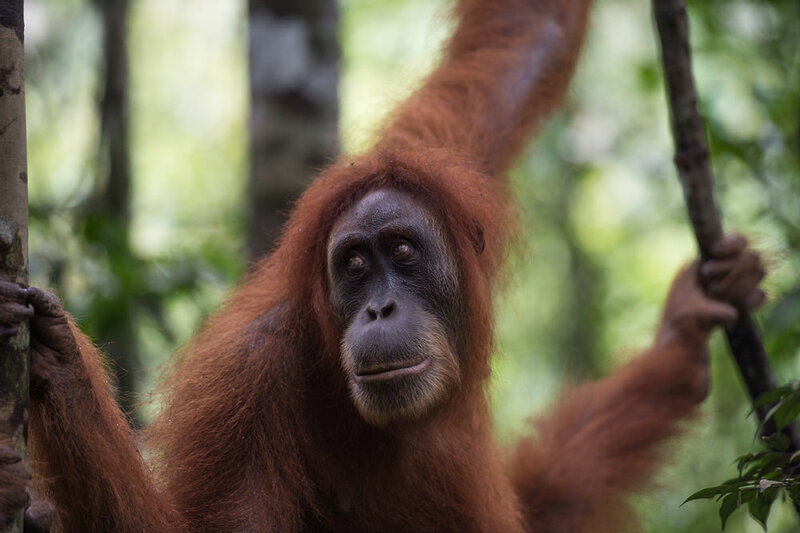 I met Timo and his girlfriend Cynthia on the way to Bukit Lawang, and was fortunate enough to go on my orangutan trek with them. Many of the photos you see in this post were taken by Timo and generously sent to me for the purpose of this post. You can see more of Timo’s photography by visiting his Instagram: @stahlson_vom_dach.